Moorish playing cards, two uncut sheets, early fifteenth century. 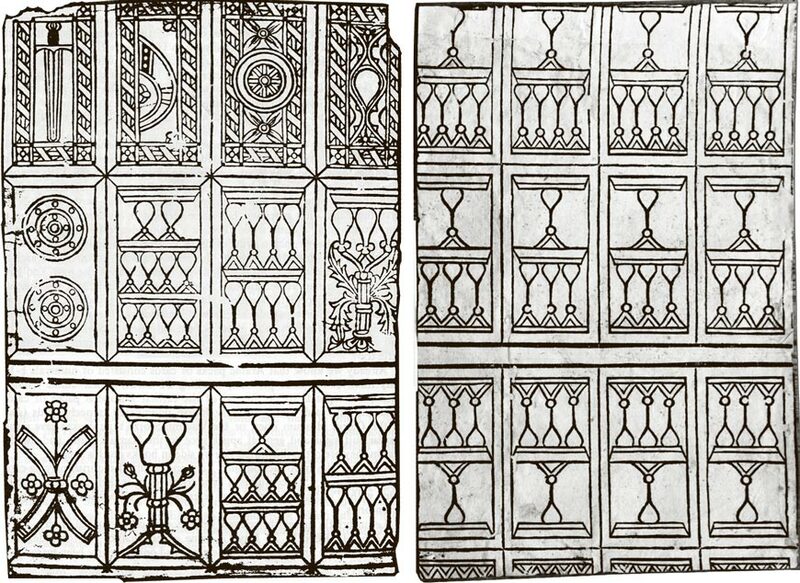 These two uncoloured, uncut sheets of early Moorish playing cards were formerly preserved in the Instituto Municipal de Historia in Barcelona. They were first brought to light by Simon Wintle in 1987 and described by him in: A 'Moorish' Sheet of Playing Cards, in "The Playing Card" Vol.15 no.4, 1987, IPCS, England. (The original article can be downloaded here.) The cards are printed from woodblocks as bold black outlines. No court cards are present and the numerals evidently ran from 1-10. The four aces (top row, left) illustrate the suit symbols: a downward-pointing sword, complete with hilt; an ambiguous, curved shape which might be seen as a curved club (on what is probably the two of 'clubs' we see two curved strips not crossing but juxtopposed); a simple disc or coin decorated with concentric circles; and a stemmed cup or goblet resting on a triangular base. Unlike the remainder of the pack, these four aces also have geometrically patterned borders. The earliest historical reference to specifically moorish designs in Barcelona is dated 1414, and subsequent discussions have led to the conclusion that these cards are possibly the earliest set of European playing cards that have come down to us. The pack was made before the 10s had been suppressed, and are possibly of Christian manufacture in imitation of some Muslim prototype. From the ambiguous form of the 'baton' suit sign one gets the impression that the card-maker was not sure what the corresponding symbol in his prototype was supposed to represent. In addition they have a striking stylistic similarity with the Islamic Mamluk cards preserved in Istanbul. Indeed, they look like a plainer and more rudimentary version of the same thing, which suggests that there may already have been an established style of 'Moorish' playing cards being produced in Spain since the earliest times after their introduction. Finally, we can note that in the left-hand specimen the borders of each card suggest that the backs of the cards were folded around to make a margin around the fronts of the cards, as in Italian cards and some other 15th century Spanish cards. Was this method of production inherited from Moorish cards? The outwardly curved two of 'batons' also resembles the arrangement of swords in the archaic 15th century Italian suit system.